Refunds will be delayed again this year. It was not just last year; it’s the law. Most low-income families won’t see refunds until late in February. Looking to use your tax refund to help pay your holiday credit card bills in January? You could be left out in the cold! 3 Facts About Fast Advances! We have a no cost – that’s right – it’s a FREE option for you to get an advance on your refund, up to $1500. No need to wait at all, you can get your advance* fast – can be as quickly as within in an hour! If you earn a larger tax refund you qualify for the program too! You can get up to $2,500 in as fast an hour, the first $1500 has no cost to you. The remaining $1,000 is subject to an APR charge. APR varies by state. Advances are in denominations of $ 500, $1000, $1500 which are free. Advance can comes as fast as an hour via a paper check or loaded onto our bank’s prepaid card. In conclusion: Don’t wait to book your appointment to get your taxes done! The faster you book and file the sooner you can get your Fast Advance. 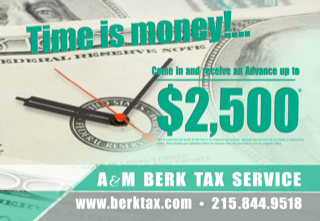 Feel free to call our office at 215-844-9518.